Three runners for the stable at Ballarat on Wednesday including Gottaluvtrucks on debut. Gottaluvtrucks is the first to go in race one, the 3YO Maiden Plate over 1200m with Patrick Moloney to ride from barrier seven. The son of Camelot has been brought along patiently by Mike Moroney and has shown ability in his jumpouts at Flemington. “From where he has drawn it should not be too difficult with just one turn to go around,” Moroney said. “He’s got some gate speed so ideally we’d see him take a position and then be able to finish off. Bill The Bee will be racing for the second time in race three, the Maiden Plate over 1400m with Patrick Moloney riding from barrier 10. It is the first start this preparation for the son of So You Think which finished fourth on debut at Ballarat over 1106m in April. “He’s had a couple of jumpouts here and pleased us with the way he is going,” Moroney said. “With what he’s been showing us at home the 1400m first-up should be ideal for him. Whosyourhousemate (pictured) runs in race eight, the Benchmark 70 Handicap over 1500m with Patrick Moloney riding from barrier one. 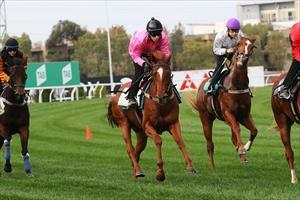 It is the third start this preparation for the import which finished sixth over 1400m at Sandown on July 25. “It’s been a little while between runs but he’s had a solid jumpout since and he looks magnificent,” Moroney said. “I think he’s better striding along rather than being restrained and the plan is to let him settle where he’s happy.